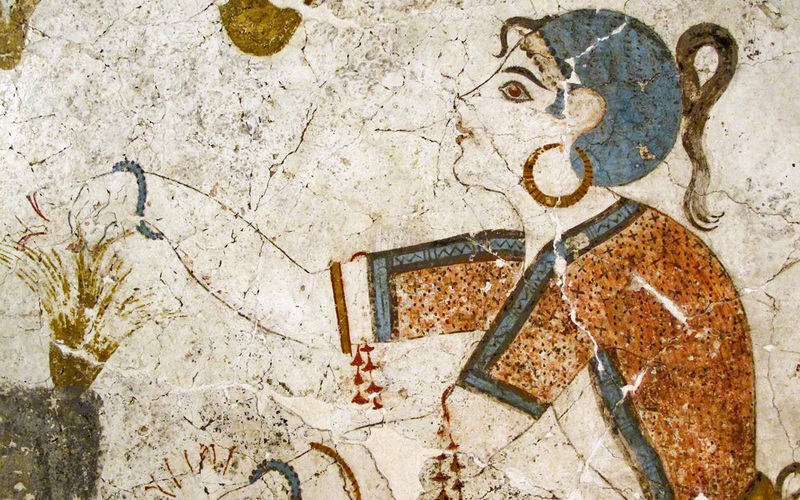 Detail of the fresco "The Crocus Gatherers"
Santorini in the Bronze Age: A society fed on prosperity and pleasure, enjoying a cosmopolitan life and the riches of maritime trade, is reflected in the eating habits of its members. Shrewd merchants import ornate cups and an array of luxurious cooking utensils, potters craft vases and jars bearing stamps explaining the goods they are meant to store, and fishermen turn their catch into “garos,” a paste made of tiny fish and brine: Theran professionals putting their craft at the service of what we today call “gastronomy”. Oil is produced in stone olive presses, and rye and wheat is ground in stone mills. Pies are baked to a golden crust in portable ovens. One covered pot is used for baking (with a flat bottom) and another for boiling (with a rounded bottom), and they are placed on the stone-built open fireplaces that every home is equipped with. And when the fancy takes them, the Therans cook meat on a skewer, placing it on supports over the embers, making the now-famous souvlaki. Yes, this quintessential Greek dish was a popular delicacy in Santorini back in 2000 BC. ‘The Pompeii of the Aegean,’ once a prosperous city, was brought to light first by Professor Spyros Marinatos (who stopped excavating in 1974) and then by his successor Christos Doumas, who continues his research today. The eruption of the volcano in the 17th century BC covered the laden tables of the Theran people in lava and ash and violently interrupted their otherwise carefree lives – yet thanks to this cloak, which formed the perfect insulation for preserving matter of an organic origin, we now know about the sophisticated diet of our predecessors. 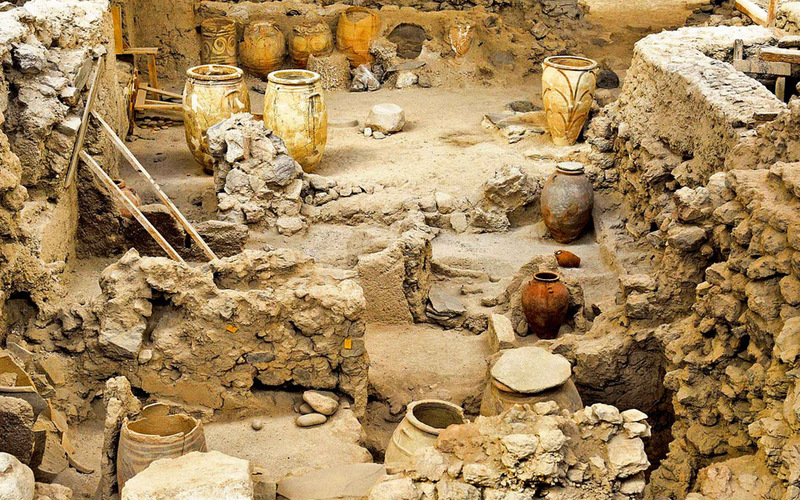 Excavations at Akrotiri, the coastal settlement on the southwest of the island, have revealed that the residents of this ancient city loved lamb, goat and fish; salted and sun-dried fish, sea urchins, scallops and clams; dried figs and fresh pomegranate juice; honey, tisanes and spices. They even loved imported delicacies such as snails from Crete. Archaeologists believe that the bon viveurs Therans had also learned how to make beer out of barley through their commercial ties with Egypt. Of course, as far as alcoholic beverages are concerned, the heart of Therans always went, and continues to go, to wine. 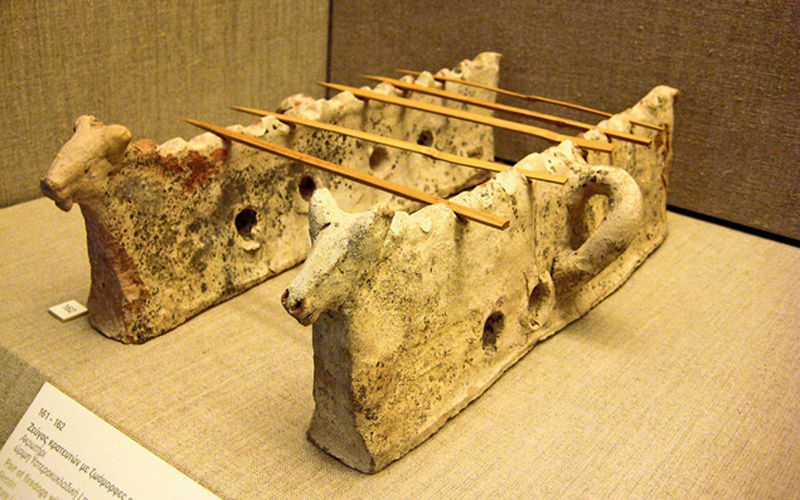 A pair of clay supports, a portable cooking facility used to grill meat on skewers, shaped in animal form (1600 BC). This is the way prehistoric souvlaki was made. Akrotiri has revealed a wealth of information on the voluminous chapter that is wine: From special equipment for pressing the grapes and gathering the must, known as “lino,” to the collection of seeds (“gigarta”), but also to the amphorae decorated with grape motifs, finds show that the locals have been active in growing grapes and producing wine since then. The particularities of the landscape and climate lent themselves to single-crop farming, which was capable to bringing in wealth. So, ships laden with amphorae of wine would sail across the Aegean, selling the crop of Santorini’s vineyards. And, of course, the wine was not just destined as a bartering good, but was also used for the pleasure of the locals: thousands of cups and goblets, some with a print of a vine leaf on the bottom, testify that here, in the middle of the Aegean Sea, the residents would ritualistically enjoy a drink that was of the same high quality as the food they consumed – and naturally it wasn’t mere water. Akrotiki. 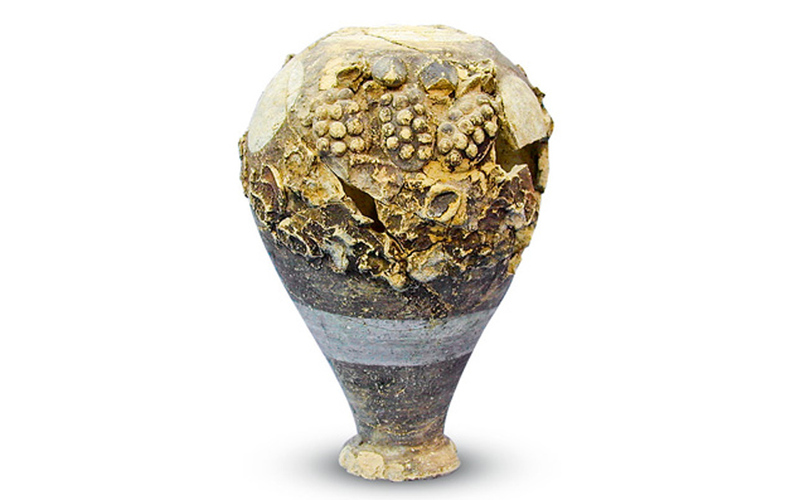 Prochis clay jug (circa 1630 BC), decorated in bas-relief with grape bunches. 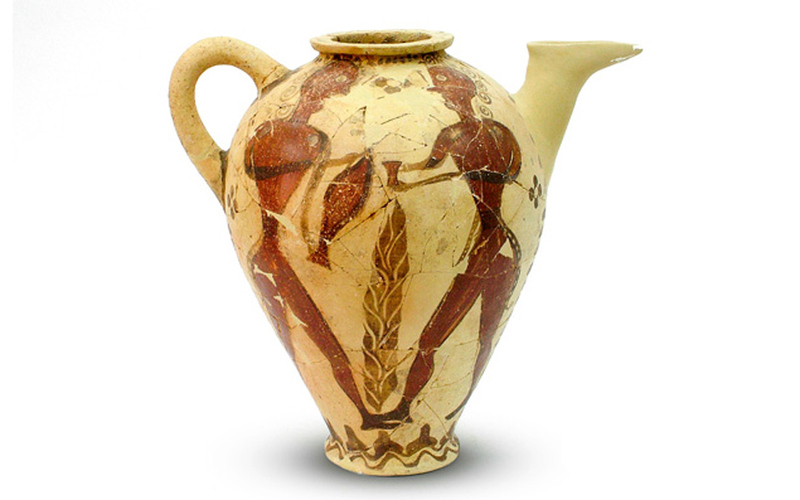 Middle Cycladic-era (1800-1700 BC) clay jug known as the “Ganymedes’s prochus”. There is a delightful statuette (currently on display at the Museum of Cycladic Art in Athens) called “The Libation-Bearer”: a white human figure sitting on a stool and raising a glass in what appears to be a most natural pose for a toast. This marble Cycladic figurine helps us form a picture in our mind’s eye of a Theran man in that long-lost era. Poised to take a sip from his cup (what else would it contain but wine – after all, no one toasts with water) and possibly in the company of good friends, this happy-go-lucky islander is much the same as the present-day, open-hearted Santorinian, who knows how to eat, drink and make merry, introducing his guests to the generosity of his land and of his people. If gastronomy, therefore, is a quality that elevated food from mere sustenance to a supreme pleasure, then that Theran had it figured out a long, long time ago.